Sage Creek Swim team members warm up during practice. 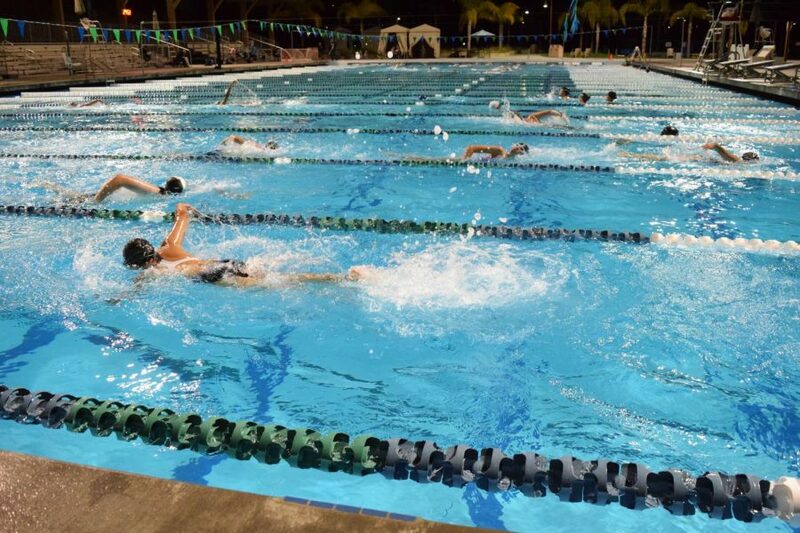 Swim team practices every Monday through Friday at Alga Norte Aquatics Center. After 5 years of waiting, student swimmers finally have the opportunity to represent their school in the pool. They practice and compete at Alga Norte Community Pool in Carlsbad. Led by head coach Agatha Brown and assistant Joanie Morgan, the Sage Creek Swim team amassed 53 swimmers. With 11 girls and 17 boys on varsity and 10 boys and 15 girls on JV, Brown believes that the swim teams can compete at a high level this year. “I definitely have faith in our teams, I know how hard they work and how dedicated they are, you can tell they’re excited that Sage finally has a team,” Brown said. Brown loves the sport of swimming and previously helped coach La Costa Canyon’s swim team for 8 seasons, who reached many milestones while she was on LCC’s coaching staff. Junior Ryan Rogers, has faith in the new program and believes Brown was the right choice for head coach. “The program is only going to the get better as we get experience and with coach Brown. She really knows her stuff and works will all the kids well,” Rogers said. Sophomore Alana Williams, has been swimming for nearly her whole life and is really pleased with the recent addition of the swim team to Sage Creek’s Spring sports. “I am very excited to be competing at the high school level, I’ve swam for club and I have a personal coach, but I am really looking forward to overcoming the obstacles I’ll be faced with during this season,” Williams said. Sage Creek’s brand new Swim Team has their first ever swim practice at Alga Norte Community Pool on Thursday, March 8th. I think you meant “yote” my good sir.